Earl Spencer says: "This may sound strange and unbelievable to you, but it is real and true." Hello, I am Miss Young. I received this story from a friend. Let me call him Roger. Go to the homepage to see more stories. I HAVE TO THANK YOU FOR THE INFO ON THE WEB SITE. I AM A VERY CAUTIOUS PERSON AND WHEN I FIRST READ SOMEONE NAMED “GEORGE BRUMLEY” LEFT ME 5.1 MILLION DOLLARS I WAS SCEPTICAL. I NEVER HEARD OF HIM. IT WAS FROM A SO CALLED ATTORNEY NAMED EARL SPENCER FROM ENGLAND. BUT AS I RESPONDED IT STARTED SOUNDING MORE AND MORE LIKE REALITY. THEY EVEN E-MAILED ME A CERTIFICATE OF DEPOSIT, CHANGE OF BENIFICARY AND A COURT DOCUMENT NAMING ME AS BENEFICIARY TO 5.1 MILLION. ... I AM NO ROCKET SCIENTIST BUT AS I READ OVER THE EMAILS I NOTICED SPELLING AND GRAMATICLE ERRORS. AND I AM A TERRIBLE SPELLER! THEN I GOOGLED “GEORGE BRUMLEY” AND FOUND YOUR WEB SITE. I AM EVEN THINKING OF HAVING A LITTLE FUN WITH THE CROOKS AT THEIR EXPENSE! MISS YOUNG, HERE IS THE FIRST E-MAIL I RECEIVED ON THE SCAM. society. Late Brumleys' legacy is the love of charity. 3.Contact Telephone and fax numbers. CALL ME TO DISCUSS BEFORE I GIVE OUT MY HOME ADDRESS. GOOD DAY.HOW ARE YOU AND YOUR FAMILY?HOPE FINE.THANK YOU FOR YOUR INFO, I WANT TO INFORM YOU THAT I HAVE CONSULTED THE SERVICES OF THE HIGH COURT OF JUSTICE IN THE UNITED KINGDOM TO PROCESS THE CHANGE OF OWNERSHIP AND AUTHORISATION GIVING YOU BENEFICIAL STATUS OVER THE FUNDS AND COPIES OF THESE DOCUMENTS WILL BE FORWARDED FOR THE ATTENTION OF THE BANK IN THE NETHERLANDS WHERE THE LATE DR. GEORGE BRUMLEY HAD THIS FUNDS TOTALLING US$5.1MILLION DEPOSITED IN. AS SOON AS THIS LEGAL DOCUMENTS ARE APPROVED AND ENDORSED BY THE HIGH COURTS I SHALL FAX THE REQUIRED DOCUMENTS BACKING THE DEPOSIT OF THIS FUNDS IN HABIB BANK HERE IN THE NETHERLANDS IMMEDIATELY TO YOU ,PLEASE BE INFORMED THAT I REQUIRE THAT YOU RECONFIRM YOUR TEL/FAX DETAILS INCLUDING COUNTRY CODE AND YOUR FULL NAMES IMMEDIATELY,I WOULD REQUIRE YOUR FAX NUMBERS SO THAT I CAN FORWARD THE DOCUMENTS FOR YOUR ATTENTION AND PERUSAL, OR LET ME KNOW IF YOU WILL PREFER I SEND THE INFO THROUGH EMAIL ATTACHMENT. NOTE:IT IS OF UTMOST IMPORTANCE THAT WE DISCUSS THE MODALITIES VIA PHONE, AS MY LAW FIRM AS EXECUTORS OF THE LATE DR. GEORGE BRUMLEY'S ESTATE WILL BE ENTITLED TO 5% OF THE TOTAL SUM WHICH WILL BE REGARDED AS LEGAL CHARGES AS SOON AS YOU TAKE PO CESSION OF THESE FUNDS TOTALLING US$5.1MILLION.IF YOU REQUIRE ANY VERIFICATIONS YOU CAN CALL ME ON MY TELEPHONE NUMBER : +44 1216187155. THE FUNDS ARE IN A HOLDEN ACCOUNT IN HABIB BANK IN THE NETHERLANDS, DETAILS OF WHICH I WILL DISCLOSE TO YOU AT A LATER HOUR AS SOON AS WE ARE SURE OF YOUR TRUTH FULLNESS AND SINCERITY IN THIS MATTER,ALL LEGAL DOCUMENTS STATING THAT THIS FUNDS ARE GENUINELY WILLED TO YOU BY THE LATE DR. GEORGE BRUMLEY AND THAT THE FUNDS ARE LEGITIMATE AND A GENUINE INHERITANCE CLAIM ARE WITH ME AND WILL BE FORWARDED TO YOU. PLEASE I WANT US TO CONCLUDE THIS PROJECT AS SOON AS POSSIBLE SO THAT MY CLIENT THE LATE DR. GEORGE BRUMLEY WILL FINALLY REST IN PEACE WHEREVER HIS SOUL MAY BE. I LOOK FORWARD TO MEETING AND CONCLUDING THIS BUSINESS WITH YOU. THANK YOU FOR YOUR ANTICIPATED CO-OPERATION . I REALLY THINK YOU HAVE THE WRONG GUY. I DIDN’T KNOW GEORGE BRUMLEY. I WILL CALL YOU IF YOU WANT BUT I DO NOT KNOW WHAT THE TIME DIFFERENCE IS. YOU CAN E-MAIL ME ANY DOCUMENTS INSTEAD OF FAX. I DO NOT HAVE A FAX MACHINE. I CAN BE REACHED AT 888-999-444. DO YOU WANT ME TO CALL YOU? I LIVE IN FLORIDA IN EASTERN STANDARD TIME. WHAT IS A GOOD TIME TO REACH YOU ? THIS IS THE MOST CONVINCING. NOTE AT THE END THEY ARE ALMOST DEMANDING ME WHAT TO DO. (1. )The Certificate of Deposit: This is the Certificate backing the deposit of this funds in Habib International Bank. It was issued when Dr.George Brumley made the deposit of this funds in their Bank in the Netherlands. 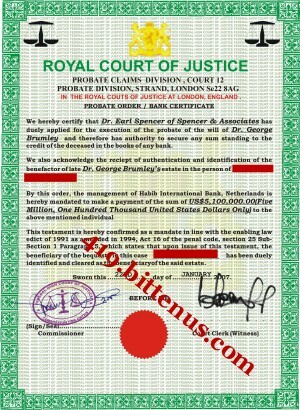 (2)A sworn affidavit of change also sworn to at the courts here in London ,this document recognises you as the legal reciever of the estate of your benefactor Dr.George Brumley. 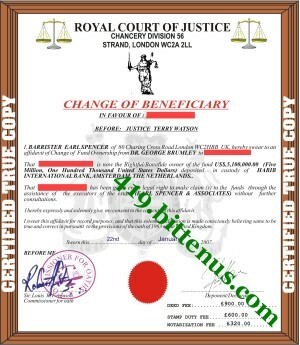 (3)The letter of Probate from the High Court Of Justice approved also at the High Court here in the United Kingdom. 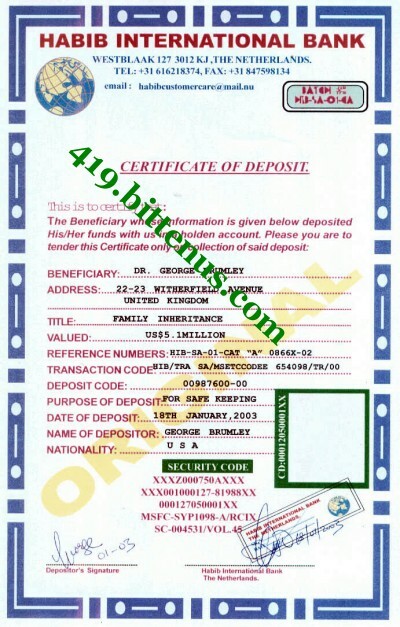 Note that this papers gives you legal powers to be the beneficiary of this funds from Habib International Bank in the Netherlands.This authorizes you to be the legal recognised next of kin to Dr.George Brumley. You are to inform the bank that you are the beneficiary of this funds in their vault deposited by the late Dr.George Brumley since January last year, but due to your tight business schedule,you have not been able to come forward to claim this funds but now that you are less busy, you are ready to come forward for your funds.Please enquire from the bank the necessary procedures to lay claim to this bequest as you are the legitimate beneficiary. Please inform me from time to time on your progress with the bank so as to ammend all necessary records on our side. WOW THIS IS AWESOME. I REALLY DIDN’T THINK THIS WAS REAL BUT THOSE DOCUMENTS MUST BE REAL! WHAT CAN I DO TO SPEED THIS TRANSACTION UP ? I AM READY TO RETIRE! THANK YOU MR SPENCER FOR FINDING ME. I AM NOT SURE WHY GEORGE BRUMLEY IS LEAVING ME THIS MONEY. HE MUST BE A DISTANT RELATIVE. I AM SO HAPPY. RE: FUNDS DEPOSIT TOTALING US$5.1MILLION . Thank you for your correspondence.We are the correspondent and paying bank via Reserve Bank.We have certain amount of funds with the above mentioned value presently in our custody in a Holden account with your name and address attached to it on our instruction. Could you confirm to us the ownership of the said amount and its purpose for our records and also most importantly we will require your valid identification for sighting purposes by email attachment or fax(strictly for identification purposes) so as to be sure that you are the true beneficiary of this funds in question as Habib International Bank will not be held liable for the wrong transfer or release of these funds to the wrong beneficiary and the antedant consequences.Also endeavour to forward to us all valid documentation backing your claim to this funds via fax or email attachment. An urgent reply is needed ASAP to enable an onward deposit to the account provided. Please call me on receipt of this message for more clarification. I HAVE TRIED TO E-MAIL YOU A COPY OF MY PASSPORT FOR IDENTIFICATION. IT KEEPS COMING BACK SAYING YOUR MAIL BOX IS FULL. DID YOU RECEIVE IT ? FUNDS DEPOSIT TOTALING US$5.1 MILLION. Thank you for your correspondence, we have confirmed all documentation backing your claim to the said funds deposit and has been ratified as accurate by the accounts and reconciliation department. Please study the attached account activation forms carefully , have them filled and sent back to me ASAP to enable us activate an account in your favour and issue you an account number and a four digit pin code to enable you have unrestricted access to your account. Roger is still in contact with the false Earl and the false bank. Will he become a millionaire? It is correct that George Brumley died in a plane crash, but the rest of the story is all lies. His name name been used in several scams, f.ex. the Moussa Ekoly story, the Salif Ali story, the Micheal Mensah story, the Jimoh Bashiru story, the DUOMI ABULLA letter, the Salif Akain letter and the Mike Bello letter.